I’ve finally had some time to stop, relax and do some proper sketching and drawing recently on board Aedis. Up until recently we have been sailing our bums off trying to get out of the Schengen zone (the Montenegrin coast) so we don’t outstay our visas (as an Australian citizen you can stay 90 days in any 180 day period). This has meant life has been sailing night and day with some brief reprieves to sleep and maybe edit some videos. On our way past Sicily we had a couple of friends visit us for a few days, so we decided to make the most of it and visit the beautiful and dramatic Aeolian Islands (north of Sicily). Unfortunately we didn’t have time to see them all (I would have loved to spend 3 weeks pottering about) but the islands we did see were unbelievable: Filicudi had the most incredible sea cavern that was like a small lake inside a cliff, Stromboli is an active volcano that could be seen spouting ash during the day and a spectacular orange light during the night (plus the most beautiful little town nestled at the base with dramatic black beaches), and Panarea was a glory of light hitting rock formations amongst crystal clear water (with bonus amazing cacti growing in improbable places). Hopefully one day I’ll be able to come back to these islands and spend A LOT more time… and if I ever decide to live back on land, Stromboli is right up there on my list with a beautiful artist community, lots of cats, and the cutest houses amongst the greenery. Come play at Adelaide Fringe’s first ever Digital Playground! With virtual reality headsets and the amazing Cube by Google’s Creative Lab, bring to life a six sided story or be transported to different worlds in this digital playground made real. In a first for Australia, Adelaide Fringe and Google Australia are supporting visual artists to make a work for The Cube with Adelaide based Gilbert Kemp Attrill and Claire Marsh making a new screen based work premiering at Digital Playground. Enter the world of virtual reality and 6-sided moving image at the State Library of SA. This special exhibition event features works by Australian and international artists especially created to experience on virtual reality headsets and the Google Cube. Be transported to different worlds and different spaces in a curated VR program by Melbourne creative company VRTOV (Oscar Raby, Katy Morrison and Jess Linington) and experience sensational animated worlds designed by Adelaide’s own Novus Res and 360 video by Jumpgate. Adelaide Fringe is delighted to team up with Google’s Creative Lab to present a moving image work for the Google Cube. The Cube is an experimental form for interactive storytelling and allows filmmakers, musicians, artists and other creatives to make interactive films where the viewer controls the narrative structure. “Hive” now showing at the Adelaide Film Festival! Ovid’s classic Metamorphoses begins with the statement: “My purpose is to tell of bodies which have been transformed into shapes of a different kind.” A similar purpose emerges within Hive. Hive is an exploration of metamorphosis and thresholds. Ingestion and regurgitation. The uncanny feeling of loosing one’s way. An observation of an otherworldly traversing of thresholds at once familiar and alien. Transformation and bodily ambiguity are a way of expressing, exploring, and possibly accepting those things we feel do not belong, are not quite right. Bees are beings born of metamorphosis: an exploration of internal and external worlds; ghosts made solid that haunt the ruins of a broken body, but are somehow also hopeful and belonging. This is their home, their hive. A Month of Mayhem unleashes screenings, exhibitions, performances, seminars and workshops for Deaf and Disabled artists and audiences. This is the largest, most significant program of its kind ever to be held in Australia. ADL Film Fest is thrilled to present works including shorts, animations, installations and outdoor projections made by Deaf and Disabled artists and filmmakers. These inventive and unapologetic works will change your preconceptions. 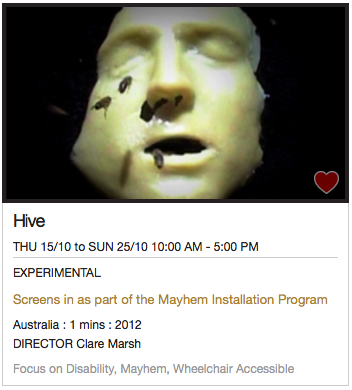 The Mayhem Installation Program runs in the State Library of South Australia Main Foyer during opening hours. Adelaide artists in “Menagerie” at Urban Cow Gallery, come along to the opening or drop by some time to have a look! Adelaide Central School of Art graduates Claire Marsh and Fiona Roberts finish an illustrious 2012 with the opening exhibition in the apocalyptic The End series at DIY art space Format. The Beginning Of The End considers human response to trauma, and Marsh and Roberts’ works of fragility, illusion, surrealism and the grotesque are both poignant and masterful. Fiona Robertson In Knots 2012, mixed media. Photo: Fiona Robertson. Roberts’ curiously unsettling In Knots is a small sweep of brown hair, not unlike a woman’s ponytail, that emanates from an open mouth, frozen in movement, at its crown. The deeply human yet physically impossible hybrid creature that lies on the floor of the space evokes both wonder and unease, raising questions as to what can constitute humanity – at what point does a collection of disparate parts become a being? How much of a body can be lost or rearranged before becoming something ‘other’? Similar questions are evident in Marsh’s Crux, which anchors the exhibition, much in the same way her piece Shelter helped anchor the 2012 Waterhouse Natural History Art Prize. Where Shelter’s patchworked fur formed a clam-like vessel big enough for a person to curl up inside, Crux is a closed form that lazes on the floor. Kangaroo fur is stitched and compiled to make a new, hefty beast whose only identifying features, aside from the faceted fur, is a grid of four breast-like forms at one end. It’s a curious thing – docile, maternal, difficult to connect with and yet inexplicably inviting. There’s an overwhelming urge to touch, stroke or embrace the form, perhaps to see if a connection with living energy will rouse it, or simply confirm its dormancy. A befitting companion piece is Cloven, a pair of high-heeled shoes adorned with a voluminous fur covering. At first glance the shoes appear to be carved from bone, with marrow and dirt remaining in cavities etched into the sole. Yet the floorsheet reveals the true material – they are regular shoes covered in beeswax, and are a testament to the craftsmanship of the artist. In contrast to Crux, Roberts’ installation The End legitimately invites interaction. A large maroon leather-bound book and two white gloves sit atop a small wooden desk. The book is a weighty tome, perhaps a thousand pages or more, and its title is simply ‘The End’. It’s ominous and clean. Who dares to open it? Those that engage in the glove-donning ceremony are met with page after page of the same message: “This page intentionally left blank.” Here, free will and determinism collide within a piece that is at once both disappointing and relieving, although many will not be brave enough to engage with the work – not out of fear of learning their fate, but out of its position in an exhibition whose delicacy of both subject and object seems almost certainly off limits to wandering hands. Particularly delicate is Roberts’ In Pieces: thirteen small white ceramic busts arranged on a shelf. Each has a head injury – removed, split, cracked, severed – with the now separate parts suspended by wire to reveal blood red flock at the site of their disconnection. Clinical in presentation, their disconnection from trauma is both physical and metaphorical. Nearby is Roberts’ second ceramic piece In Vain, where an arm emanates from a jug that is held by its own hand in a looped response to the finite. The circular piece builds on the finality and hopelessness of the thirteen broken forms and delivers a different kind of purgatory through an infinite quandary. Finally, a video work projected the full width of a wall: Marsh’s Hive. A swarm of bees crawl through holes in a damaged deathmask. The dull, industrious buzz of the insects fills the gallery but does not intrude; their insistent drone is not unsettling until matched with their grotesque movement in and out of the nose and mouth, creeping, buzzing and commanding a being that once was. Control has been relinquished; pain and discomfort is now for others to contend with. of the possible end. Through processes of visual and physical mutations, Marsh talks about what she calls “the silent, the creaturely and the horror of the self.” Roberts’ work responds to change, decay and regeneration both physical and mental, often referencing the cyclical force of nature.